Baby Valentino with father Graziano Rossi. 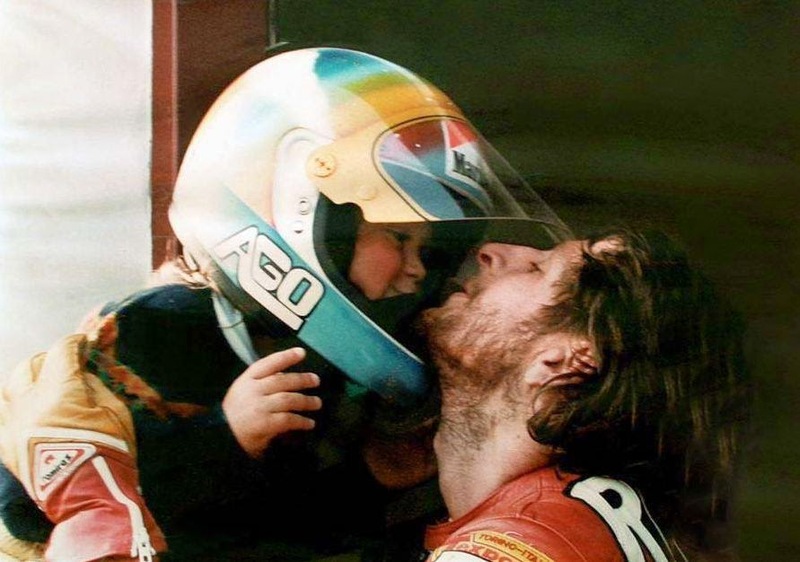 On February 16, thirty-two years ago; Stefania, a beautiful blond girl with blue eyes was in the hospital giving birth to a child whose life will mark Urbino to the history of motorcycling. His father, Graziano Rossi, a motorcyclist who races in the same "class" as Franco Uncini, Marco Lucchinelli, Virginio Ferrari. He left the Suzuki 500 with which the previous year he ended the season in 16th position in the world and is about to start a new season with the Morbidelli. The birth of the little Valentino comes in a context of general upheaval in the life of 25-year old pilot and generates further havoc. "You think I can remember what happened 32 years ago? - Said the "Grazia," as he is called by Valentino - "I remember that his mother was a mess at that time because she had to give birth and I was messed up as her, our house was a mess for the racing season was starting. Then I would be over there on a Morbidelli year and like all Februaries of life begins the season and there is always a big mess. But I remember that in spite of this I was able to be close to them "
You accompanied to hospital in Urbino? "I certainly have them escorted to the hospital and then I would definitely ... I do not remember! " Do you remember when he was born? Was it in the morning, at lunchtime or in the evening? "No, I do not remember but I think it was in the evening because in the morning he is not ready to do anything now, and even then, he is not even ready to be born in the morning, he sleeps in the morning." Was it sunny or raining? "There was absolutely no sun since the day he was born Valentino could not be less than the sun." What emotions did you feel as soon as you see him? "This is one thing that men and fathers cannot explain, because it is such an important thing that you cannot understand the emotion. The emotion was having to start doing something now for him to fix it, I do not know, to dress him, prepare him for baptism "
Did you know that the first would be a boy? "No, there were not tests so that you knew before. Right? Thirty years ago there was this test that you said it first? I do not think there was." Who decided the name Valentino? "We decided together with me and his mother, we both agreed, I do not remember who came to up with it..."
I ask you a difficult question: do you remember if it was born of natural birth or cesarean? "Natural" replies the "Grazia" after a short break. And how much he weighed? "Very fast, he could never be a slow delivery! Never! " What is left of that period? "I was 25 years old, I was a motorcycle racer and ... I just remember a great happiness, because in 25 years a man can already be mature or still as stupid as a kid and I, in 25 years, I was stupid as a kid, and when a man is so, having a child makes an effect wonderful ". "I felt the terror of the idea of having to grow up because a man with a child should become great in theory. Then instead I realized that a child is something that plays, smiles, cries, yells, makes noise, which makes a mess, then a child brings a great mess to anyone's life, a great joy and an uninterrupted series smiles and rages, because then the kids liven up life, even if it is already busy. A son brings bitterness and a great sweetness." What is the first gift that you did? "I cannot remember, you invent something... like a box of "kisses". "He has not grown more than me, luckily for him - answered amused - That if he now should have a child he would have the same emotional reaction that I had when he was born, that is, to think of having to grow at all costs when it is not necessary." What is the gift that Valentino would appreciate more for his birthday and for 2011, a year once more particular? "Let me think ... Now he has just passed a very serious problem which is the shoulder pain that has haunted him for the past year, the gift that I would like to do today is a statement, a contract signed by someone I say that will not be hurt again. " Someone like ... Jesus Christ? "Yes, some of that around, of course, is a prayer that I'd like to come true: that you he does not hurt anymore." "He and I believe enough to ask for a big favor and think that he will do it!"